Set atop the Chamberlain River, El Questro Homestead is a luxurious outback oasis. Catering to a maximum of only 18 guests, the resort accommodation features magnificent panoramic views of the Chamberlain Gorge and river systems from sunrise to sunset. 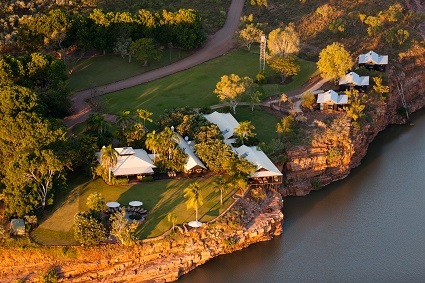 Nestled privately in the rustic Australian wilderness, the Homestead is the ideal place to fully appreciate the untamed beauty of the Kimberley. Guests at the Homestead are immersed in luxury with air-conditioned rooms featuring modern bathrooms and furnishings, surrounded by lush tropical gardens. El Questro provides the highest standards of service and cuisine, while maintaining true outback experiences for all who visit. Over the three nights, enjoy gourmet cuisine, all beverages (Cellar Masters list not included) and a personalized itinerary of guided tours within the Wilderness Park. Complimentary Scheduled 4WD Transfers between Kununurra and The Homestead allow you to soak up the scenery on your way to and from the resort. Package is for maximum 2 guests. Valid to 28 October, 2019. Blackout dates may apply.